AC Milan vice-president Adriano Galliani has revealed the Rossoneri turned down an offer of “more than €30 million” for the sale of Stephan El Shaarawy, although he refused to name the club who had made the bid. 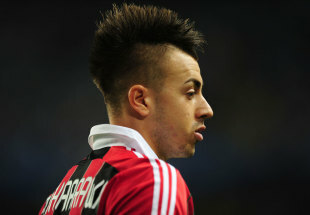 El Shaarawy, 20, has been targeted by Manchester City and Chelsea in recent weeks after scoring 16 league goals for Milan last season. Despite his efforts in his second year at the club, El Shaarawy’s form came in for criticism, prompting speculation over his future. Milan insisted last week that they would not be selling the Italy international and Galliani confirmed reports that the club had rejected a formal approach for the youngster. “What we hadn’t told anyone was that we received a very big offer for El Shaarawy, but I will never name the club involved,” he told Italy’s 7 Gold Television. “It is a very important club, though. “I informed the player’s agent and as soon as he returned from the Confederations Cup I spoke to Stephan. We did not want to sell him, so we simply informed the lad and his family that this proposal had arrived for him. Galliani says he was always confident of holding onto El Shaarawy and played down concerns over the striker’s end of season form. “We were not tempted by the offer, but we couldn’t exactly hide it from him,” Galliani added. “He saw the figures, but did not want to budge. How big was the offer? More than €30 million. “We discussed tactics for next season, as we are returning to a 4-3-2-1 system and he is happy to play as a support striker. He had a goal scoring crisis in recent months, not a physical one, but he always worked hard for the team.